Utah’s summers are seriously hot, which is why it’s so enjoyable to spend some time hanging out by—or in—the water. Instead of another day spent lounging among the masses at your local pool, ditch the crowds and head up Parley’s Canyon—where summer temperatures average a blissful 80 degrees—to take a dip in Heber Valley’s best reservoirs, rivers, and thermal springs. From scuba diving in a warm water crater to swimming laps around an island, you won’t believe you’re still in the Beehive State. If you enjoy the water, head to this state park where you can swim, paddle, and play at this reservoir—all just 15 minutes from Heber City. Surrounded by Wasatch peaks and home to sandy beaches, Jordanelle’s a swimmer’s dream. 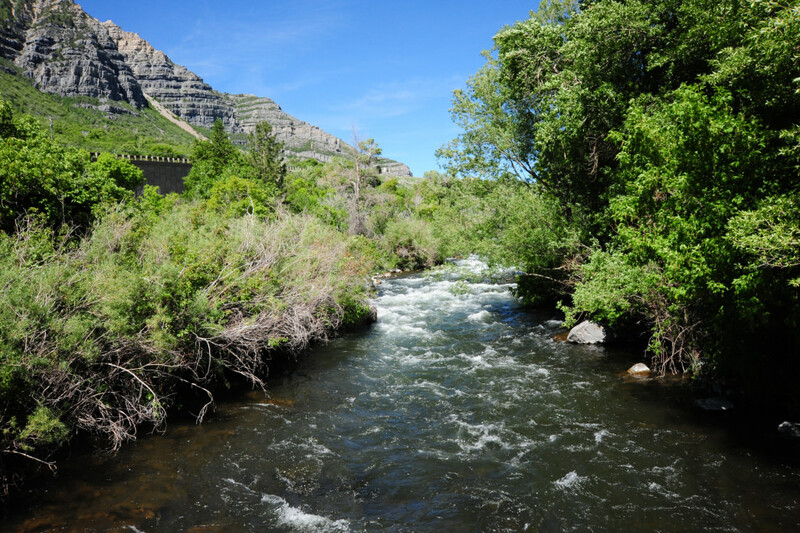 For solitude and less development, visit the quiet Rock Cliff Recreation Area on the reservoir’s eastern shore where views of the Provo River flowing into Jordanelle await. It’s the best swimming spot thanks to a long "wakeless" bay, and a training destination for triathletes. Find more people and amenities at Hailstone, the bustling park headquarters, where there’s a beach house with snacks and a swim-safe beach. Here a wakeless zone prevents big waves from killing your swim groove, and you swim without worry since motorized crafts have to keep out. Can’t get enough of Jordanelle? Spend the night at a Floating Campground and enjoy the lake life after dark. The two-level secluded structures are accessible by boat and are akin to rugged houseboats. Make s’mores on the gas fire pit or stare up at the starry sky on the upstairs deck. Then pitch your tent or fall asleep peacefully under the stars, knowing that you’ll be the first ones on the water tomorrow. For more swinging, slipping, and sliding in your swim, visit Jordanelle Reservoir’s Hailstone area to access the AquaXzone, a floating inflatable water wonderland with bouncy playground-style features. Swimmers don life jackets and fly through the air on trampolines and pads—splash landing in the water whenever possible. Open every day of the week throughout summer. Kids and adults acting like kids are welcome. 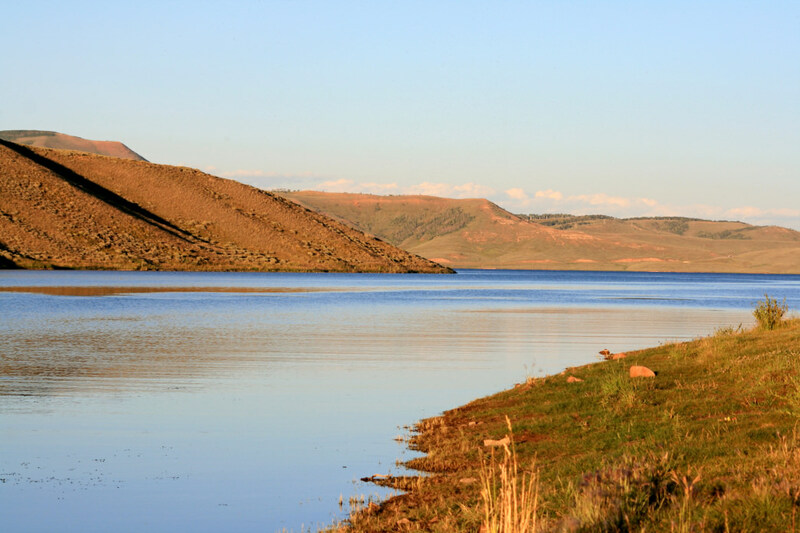 Conveniently situated near Salt Lake City, Park City, and Provo, Deer Creek Reservoir features clear water and frequent wind that make it excellent for sailboating. You’ll also find impressive views of Mount Timpanogos and the Wasatch range. For the best swimming conditions, go early before the boaters arrive and head to Wallsburg Bay, a no wake zone. It’s the safest spot for avoiding boat traffic and is mostly protected from the wind. If you’re swimming for distance, try laps around Island Beach. There’s a quiet, sandy beach for chilling, suntanning, and sandcastle building when you need a break, and each lap around the island is 1.2 miles—so it’s easy to measure your progress. Swim until your legs go numb in the icy Provo—a snowmelt-fed river that’s a Utah hot spot for floating—then hop back into the comfort of your tube and float down the canyon. On a hot summer day, floating the Provo’s a perfect way to cool off, but don’t expect a lazy ride. Whether you raft or tube, be ready to paddle through rapids while dodging branches. But look up now and then, too, as this spectacular journey showcases Provo Canyon with views of 11,800-foot Mount Timpanogos. Tie the tubes together in a group if you don’t like to fend for yourself. 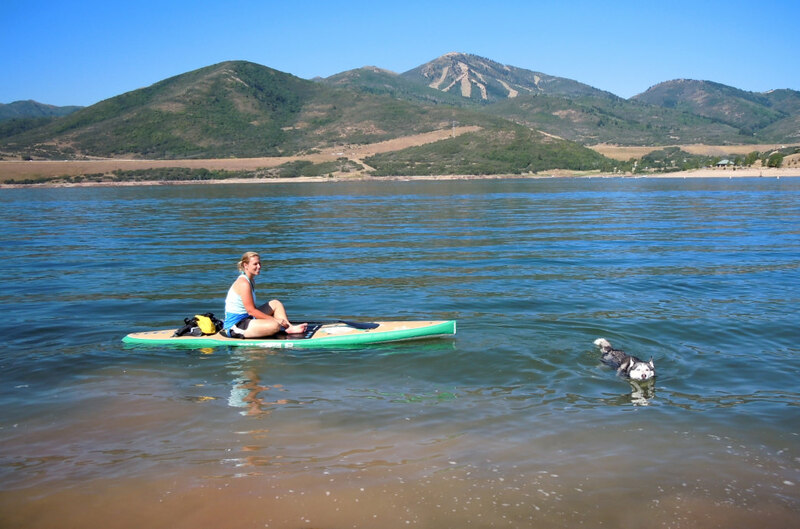 Hoping to practice your wetsuit swim skills? Strawberry Reservoir’s the place for you. Even in summer the water’s quite chilly here, in part due to the 7,200-foot elevation, making the impressive fishing more of a draw than swimming for locals. In fact, Strawberry is Utah’s most popular fishery, and fishermen routinely reel in up to 24-inch rainbow and cutthroat trout. 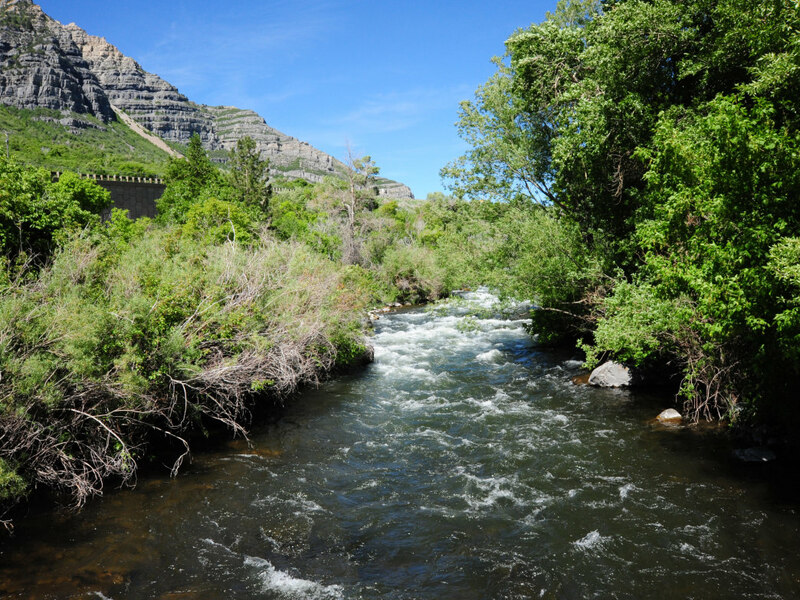 Back in the day—1930 to be exact—the biggest cutthroat ever caught in Utah was found here. But back to the swimming, you can definitely splash in the water by the sandy shore, or chill in a float tube and just dip your toes in to stay cool. After all this talk of cold water, you’re probably looking for a warm-up. Head to Heber Valley’s most unusual swimming hole, the Homestead Crater, a natural, 65 feet deep, geothermal spring found underneath a dome of limestone rock. A hole at the top lets in fresh air and lights up the blue water below, which maintains a temperature of 90–96 degrees Fahrenheit year-round. Visitors come to soak in the therapeutic mineral waters, test their balance with paddleboard yoga, snorkel, and even certify in scuba diving. You won’t find tropical fish...or any fish for that matter...in the Crater, but as the continental United States’ only warm water scuba location, it’s become a hot spot for those looking to certify without the chill. 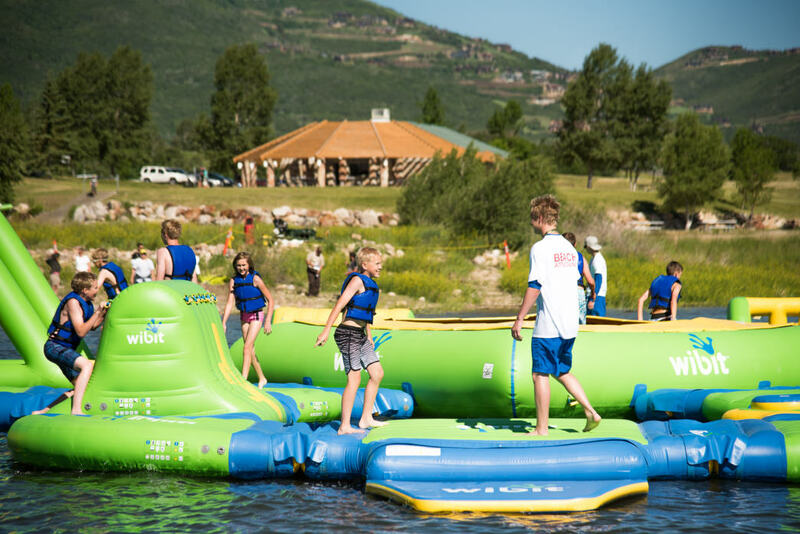 Whether you scuba dive in a landlocked crater or bumper boat your way down the Provo River, there’s no shortage of ways to spend a day on the water in Heber Valley.